Make 1 order yourself and send your link with an invitation to others. After reaching a higher level of qualification, you will never lose it! Points are calculated to determine your rank. The higher your rank, the larger the percentage of the overall turnover of your network will be paid to you by the company. You will receive a higher rank when the activity of your network becomes higher or equal to the requirement of the next rank. Your personal activity will also be included in the overall activity of your network. Personal activity (P.A.) is the amount of personally collected points per month, necessary in order to receive money from the network which was accumulated during that month. If the client does not collect the required number of points, then money accumulated by his network will be added to the earnings of the network belonging to the person who recommended that client. If the person who recommended the client also does not meet the P.A. requirement, then money will be passed on further until it reaches a person in the recommended people chain who meets the P.A. requirement. You have reached the "Director" rank. Director queues form when one of the people recommended by you also acquire the rank of a "Director", which is considered as level one director ("1D"). When another "Director" appears in the network of a level one director, he becomes a level two director ("2D") to you, and so on. 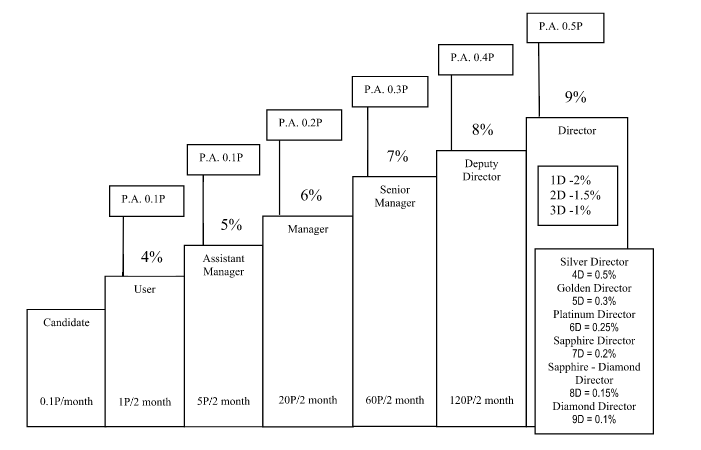 3D - 1% from the personal network turnover of level 3 director. You will be ranked as "Silver Director", when 2 candidates personally recommended by you reach the director rank. You will be ranked as "Golden Director", when 4 candidates personally recommended by you reach the director rank. You will be ranked as "Platinum Director", when 7 candidates personally recommended by you reach the director rank. You will be ranked as "Sapphire Director", when 10 candidates personally recommended by you reach the director rank. You will be ranked as "Sapphire - Diamond Director", when 15 candidates personally recommended by you reach the director rank. You will be ranked as "Diamond Director", when 21 candidates personally recommended by you reach the director rank. "Silver Director" additionally receives a profit of 0.5% from the network turnovers of level 4 directors. "Golden Director" additionally receives a profit of 0.3% from the network turnovers of level 5 directors. "Platinum Director" additionally receives a profit of 0.25% from the network turnovers of level 6 directors. "Sapphire Director" additionally receives a profit of 0.2% from the network turnovers of level 7 directors. "Sapphire - Diamond Director" additionally receives a profit of 0.15% from the network turnovers of level 8 directors. "Diamond Director" additionally receives a profit of 0.1% from the network turnovers of level 9 directors. Additional condition: A higher rank director must be active during all 12 months and raise 1 new personal Director in order to gain profit from the network turnovers of level 4-9 directors. The additional condition to raise one new personal Director will be eliminated after you reach the "Diamond Director" rank. Additional higher director rank awards will be granted once per year during the celebratory meeting.